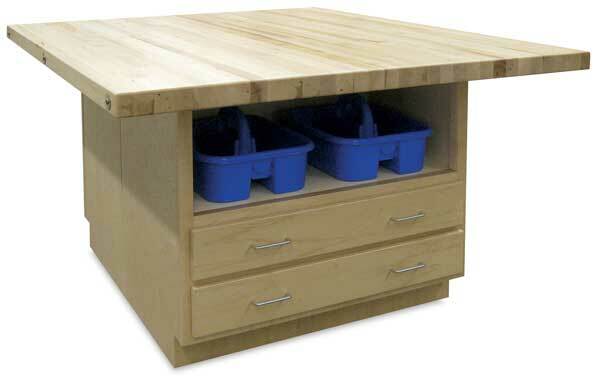 A great work area for all types of projects, Hann Art Workstations provide a large, sturdy work surface and a variety of storage options — perfect for holding papers and supplies. Generous 64" × 54" solid maple top with overhang on all sides, allowing for maximum seating and usability. This workstation has the same cabinet on both sides. The upper section of the cabinet has open space for two tote caddies (included). The lower section has two large storage drawers, which measure 3"H × 31"W × 19"D inside.